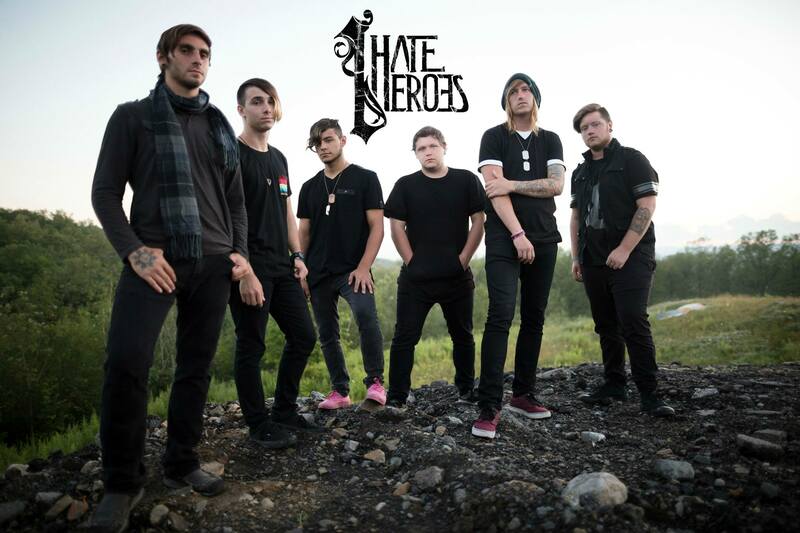 The following fill in the blank responses come from Pennsylvania metalcore/pop punk band, I Hate Heroes. This 6-piece was formed back in 2014 and is comprised of members, Ephraim Francis (vocals), Jimmy Snyder (vocals), Ricky Nachurski (guitar), Devon James (guitar), Matt Cellini (bass), and Nicholas Nachurski (drums). The band recently released their EP, If Life Were A Book, I’d Skip This Chapter and over the summer, they hopped on Warped Tour dates along the East Coast. Fans have come to know them for their dedication and engaging live shows. Learn more about the band from their responses and be sure to check out their record below. We met each other….Devon, Nick, and Ricky were friends for a long time and decided that they wanted to start a band. They have been members of previous projects, and eventually ended up starting their own. Meanwhile, Ephraim Francis was working on a solo project, and they ended up merging together in 2014 to become one band. Matt, the bassist, was a friend of Nick, Devon, and Ricky’s that they met at a show, and it didn’t take long to realize that both Matt and the band wanted him to be the bassist. Ricky ended up getting in contact with Jimmy later in 2015 to ask him if he wanted to join the band. He was currently on tour, and flew back to Pennsylvania after the tour was over to audition. After one night of hanging out and playing music, the family was formed and the rest as they say, is history. The pickiest eater is….Nick. If you can find him something he likes to eat, you will be come his best friend. The most OCD member is….Ricky. He has to have everything completely planned out and organized or he will literally lose sleep over it. For fun we like to….Almost all of us enjoy playing different sports. Ephraim and Ricky can usually be found playing video games at any given time of the day when they aren’t doing something with music. Devon likes to spend time with friends and usually you can find him and Nick hanging out, Matt enjoys watching Netflix, and Jimmy, being from California, loves to surf. We’re currently listening to….Beartooth, Blessthefall, Capsize, Periphery, Crown the Empire, Set it Off, and so much more. Our favorite tracks to play live include….It was a split decision 2, 2, and 2 with “Cut Your Losses,” “Architects,” and “Rebirth” for our favorites, but we love playing all our songs live. The first song we wrote together was…. “Rebirth” was the first song we wrote and recorded together as our current lineup. If Life Were A Book, I’d Skip This Chapter was recorded in….It was produced, mixed, and mastered in Lancaster, Pennsylvania with Ricky Armellino (This or the Apocalypse) and released in August of 2015. One thing we want you to remember while listening to our music is….A lot of our current music is based off of life experiences, which means a lot of the lyrics we feel should be able to make a connection with a variety of our audiences with an event that has either taken place, or is currently taking place. Something odd we want our fans to know about us is….We have a lot, but a couple are Jimmy only initially started playing in a band to impress a girl and Nick is the princess of the band, consistently waiting until the last minute to get ready and then proceeding to take an hour and usually making us crunched for time anywhere we need to be. We’re absolutely terrified of….The world ending or an economic collapse, spiders, and snakes, not necessarily in that order depending on the size of the spider. Our last meals would be….Devon, Ricky, Ephraim, and Matt, would go Italian with either a Stromboli or Pizza, Nick would have a tray from cook out, and Jimmy would go out in style with Red Lobster Surf and turf with mashed potatoes, a Hershey Sunday Pie and dominoes lava cakes for dessert, and Dr. Pepper and a Ballast Point ipa for his drinks. In the next six months you should expect….We’re going to be working on writing more music as well as releasing a cover in the upcoming weeks. We are in the midst of planning a tour sometime in the early months next year, as well as continuing to play shows around the area. We are also in the process of writing for our debut full-length which we are hoping to have recorded later next year. There are going to be lots of surprises coming up that we are very excited about, as we hope you all will be too! This entry was posted in Fill In The Blank, Interviews and tagged band interview, fill in the blank interview, fill in the blanks, i hate heroes, i hate heroes band, I Hate Heroes band interview, I hate heroes interview, I hate Heroes musi, interview, metalcore, metalcore interview, pop punk, pop punk interview, warped tour. Bookmark the permalink.